QuickShow is a complete laser control system including both the QuickShow software and FB3QS hardware. It allows you to create pre-programmed laser light shows, as well as giving you the ability to run your shows “live” directly from PC, touchscreen, or control board. The QuickShow software comes with nearly 2,000 pre-programmed cues already included, with a wide variety of beam effects, abstracts, graphics, animations, logos, and more for you to choose from. Simply click on a cue, and see it displayed immediately in laser light. In addition, if you want to make your own custom content, the Quick Tools inside of QuickShow make designing beam effects, graphics, text, animations, abstracts, and timeline based shows easier than ever before. The BEYOND software features a variety of new technologies that allow you to create amazing laser light shows very quickly. 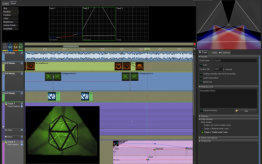 BEYOND gives you additional tools to combine lasers with other speical effects like video, audio, and DMX lighting. BEYOND is a complete system including both hardware and software, and features a full timeline with control of laser and video, as well as a 3D animation program, advanced support for MIDI, DMX, ArtNet and OSC, and expanded versions of the QuickTools and QuickFX. 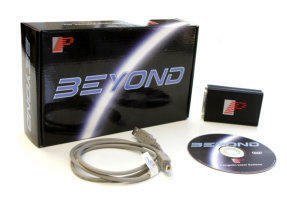 With BEYOND you can also easily interface with other production equipment, such as lighting consoles (GrandMA, HOG, etc. 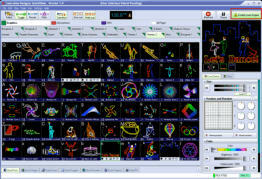 ), MIDI controllers, video projectors and more. 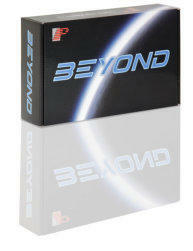 BEYOND comes standard with the BEYOND software, and your choice of Pangolin hardware. It is available in three levels: ESSENTIALS, ADVANCED und ULTIMATE. It is compatible with both LD2000 and QuickShow, so you can work with all of your shows and content, within the BEYOND software. BEYOND can be ordered with different hardware. The DiscoScan 2.0 Lens is an “electronic mirror ball” for your laser projector. In a disco or nightclub, you often want beams to fill the entire space, but it can sometimes be difficult, especially if you only have a few lasers to work with. The solution is the DiscoScan 2.0 Lens. The DiscoScan 2.0 is a super-wide-angle lens designed specifically for laser projectors. Using the DiscoScan 2.0, you can send laser beams anywhere in a 360° hemisphere. You can also do graphics, text and logos with the DiscoScan. Imagine the name of your disco or the evening’s DJ, projected on the floor along with an array of beams! Pangolin’s Professional Audience Safety System - PASS - is a patented system based on almost entirely analog components. When used with the proper integration and show production techniques, PASS assists in maintaining the safety of Audience Scanning laser light shows. PASS is significantly more advanced than simple “scanfail” products on the market. PASS is barely bigger than a credit card, and yet it includes a set of very sophisticated and complete protection systems. PASS is designed with multiple levels of redundancy and with circuitry that is designed to fail-safe. In fact PASS is designed to maintain safety even in the face of several simultaneous failures. PASS went through ten years of research and development, followed by two years of U.S. government evaluation. The result is that PASS is now recognized both in the U.S. and throughout the world a s a solid safety system for Audience Scanning. ScannerMAX is a division of Pangolin Laser Systems, specializing in galvanometer-based optical scanners. These scanners utilize an all-new patented design, which allows them to outperform other conventional optical scanners on the market. The ScannerMAX advantage is achieved by applying three mechanical principles: STRONGER – the ScannerMAX galvanometer design incorporates a visibly stronger rotor and shaft, along with a highly-durable mirror mounting scheme. In addition, special bearing materials and a stronger position feedback are used to ensure optimal performance. These differences help to improve accuracy by avoiding resonances - ultimately making your images look better. COOLER – ScannerMAX scanners incorporate an unique motor design, which reduces heat generated during scanning, while also allowing any heat that is generated to be dissipated effectively. Since heat is known to limit lifetimes in some applications and is a performance barrier to others, the result is longer lasting scanners that prevail in even the most demanding applications. FASTER – When you combine the stronger rotor design with the cooler-running motor, the result is scanning speeds that are faster than conventional galvanometers. More information about the ScannerMAX Division of Pangolin is available on this data sheet. Pangolin’s patented Safety Scan Lenses were designed to help make your shows safer, while at the same time allowing your shows to maintain a high level of visual impact. The Safety Scan Lens is a half lens, which will increase the divergence of the laser beam as it is projected downward, into audience areas. Due to the fact that it is a half lens, laser beams are not affected when they are projected overhead. Thus, the end result is that you are able to create a stunning laser light show, and keep the beams which project on the audience at an enjoyable and safe level. We offer you the option of acquiring single lenses with progressing divergence-increasing levels, or you can acquire a kit that includes all six lenses, packed into a convenient carrying case. In addition to the Safety Scan Lenses, we also make an universal mount that can easily be attached to most laser projectors, and offers three degrees of freedom when adjusting the lens’s position. Compact 506 mounted inside a laser projector. 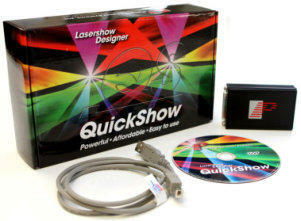 QuickShow is a complete laser control system including both the QuickShow software and FB3QS hardware. It allows you to create pre-programmed laser light shows, as well as giving you the ability to run your shows “live” directly from PC, touchscreen, or control board. The QuickShow software comes with nearly 2,000 pre- programmed cues already included, with a wide variety of beam effects, abstracts, graphics, animations, logos, and more for you to choose from. Simply click on a cue, and see it displayed immediately in laser light. In addition, if you want to make your own custom content, the Quick Tools inside of QuickShow make designing beam effects, graphics, text, animations, abstracts, and timeline based shows easier than ever before.